Perhaps old traditional deer hunting methods are good enough. American deer hunters continue to be proficient enough to keep whitetails from becoming overabundant in most states. If, however, you are a hunter who would like to improve your odds of taking whitetails most hunters only dream about, namely mature bucks, maybe it's time you consider breaking away from your traditional hunting method. There is a much better way to hunt adult bucks. 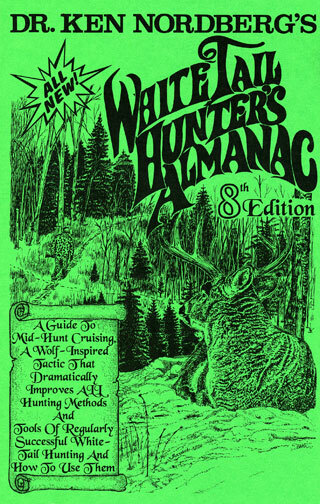 Introduced in my 5th Edition of Whitetail Hunter's Almanac in 1992, it's called "portable stump hunting." 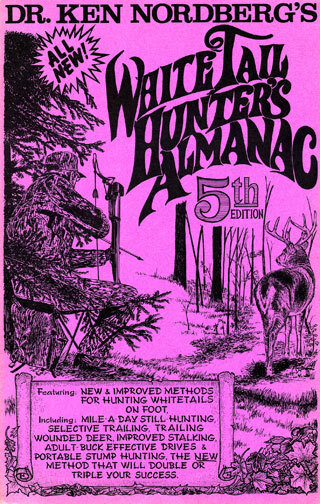 Back in the old days (I'm an oldtimer), many hunters actually sat on stumps for long periods while hunting whitetails. It was a good way to hunt, very successful. Of course, stumps were not often located at ideal sites and they were uncomfortable and damp to sit on. 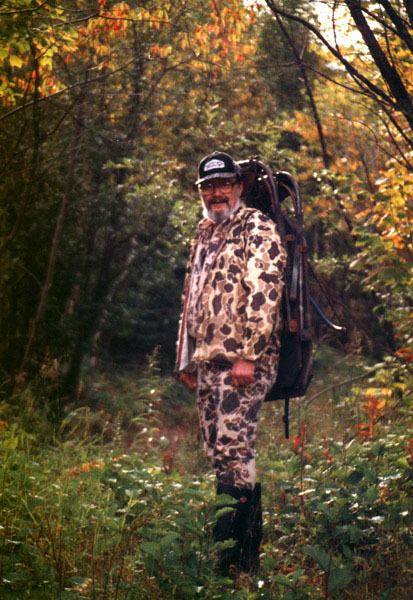 When elevated stands and buck lures began losing their once great effectiveness during the late 1980s, I decided to give stump hunting another try. Rather than using actual stumps, however, I decided to use a portable stool, one with shoulder straps that would make it easy to carry. Having learned how rapidly older bucks found and began avoiding tree stands, I made it a rule to change stand sites every half day. My stool made this easy to do. Having also learned older bucks were quick to identify even some of the smallest changes characteristic of of human stand sites, I decided to avoid making any changes in cover wherever I sat, also using natural openings for shooting rather than man-made shooting lanes. Having further learned adult whitetails readily spot the human body while silhouetted against the sky or snow, while moving, while standing upright and while skin of face and hands are bare, I decided to use stand sites only where I had a solid, natural background with some cover in front, to sit rather than stand, making it easier to remain motionless, and to wear a camo headnet (with an elongated eyehole), cap on top, and gloves. Finally, I added another rule: always approach from and sit downwind or crosswind of very fresh tracks and/or droppings made by a mature buck or a freshly renewed ground scrape made by a mature buck. This helped to assure I would not be smelled by an approaching buck. 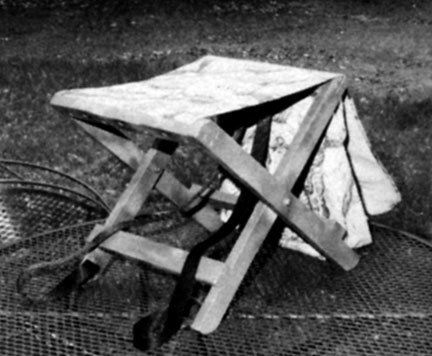 My wood and canvas stool, silently carried and silently placed on the ground for use wherever and whenever very fresh signs of a mature buck are discovered, helps to insure I will not be easily identified by unusual sounds such as those characteristic of humans carrying and putting up portable tree stands, sounds readily recognized by experienced adult deer. My stool gave me complete freedom to move from stand site to stand site at any time without tipping off an intended quarry. Whereas a cunning old buck may soon find me again after I've moved, sooner or later one of my moves would pay off. Because wolves prey on our deer year-around, we do not see near as many whitetails per hunting season as we did in the area we hunting before 1990, but since then, using our portable stumps, we've been seeing many more adult bucks. Such bucks, normally among the most elusive of big game in the world, are extremely difficult to outfox using traditional hunting methods. Our portable stumps changed matters. 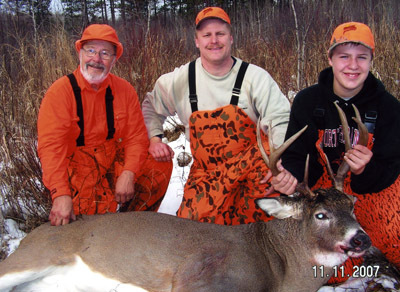 My son, Ken, has taken 15 adult bucks in 17 seasons and my son, Dave, and I have each taken 13. Everyone else in camp, with the exception of two grandson, has taken multiple numbers of mature bucks, including one or more for the wall. Doc, son Dave, and grandson Tyler Nordberg with his 300+ pound 8-pointer. One grandson shot his first buck last fall, a 300 pound, trophy-class eight-pointer that is now on the the wall. Buck hunting doesn't get any better than that.